Taring Padi from Jogja, Indonesia/ Pangrok Sulap from Sabah, Malaysia. Kaya is the toast spread made with Pandan Leaf. I had a Malaysian boyfriend during my university time, and once traveled to his country, because I was so obsessed with the taste of kaya. At the time, I lived alone in Taipei with little financial means, and knew there was a Singapore restaurant that just opened nearby. I expectantly went there to buy a bottle of kaya spread, but as soon as I left through the door, I dropped the Kaya bottle. I brought the broken bottle home and tried to piece together the broken shards so I could keep it. Spreading the kaya on top of the toasted bread, I expectantly chewed it; in my mouth I still tasted the glass, with a slightly salty flavor, which might have been my own blood. Still, I finished the whole toasted bread, where, in the summer, Taipei is hotter than the tropics; it became one of my Malaysian memories. Some art works are unexpectedly treated as plagiarism, and the artists must realize there are other artists in the world who have the same idea as them. This kind of “who is the First” and “original” notion forces artists to handle intellectual property carefully. Beyond plagiarism and coincidence, some hopeless artists think there is no real original artwork in the world anymore; it means all of the styles are from the past and imitations. Original, or, under some safe proportion’s originality, would not make audience feel too close a similarity in a glance. Many artists develop their works by imitating other works in their early stages, and as time goes on, gradually inventing their own style. But for me, the Malaysian woodprint group bizarrely doesn’t abandon the original object’s style, even though it already created its own strong theme of environment protection. It might give some sensitive audience the uncertain feeling about the art context. I saw a photo on one of my friend’s Facebook and had a déjà vu. He took the photo in Sabah, Malaysia. I thought the friend traveled to Indonesia and visited the amazing art works I’d seen before. I was surprised it was not what I thought; the same art style had appeared in another country. In the beginning, I had considered this to be simple plagiarism, but some clues made me realize there were more questions to be excavated and investigated. This drove me to crazily pursue and ponder for months. The Malaysian woodprint group that formed in 2010 is called Pangrok Sulap, which literally means “ punk rock shed”. “Pangrok” is from the local accent to pronounce the words “punk rock”, and “sulap” is a bamboo shed for Sabah aborigines. 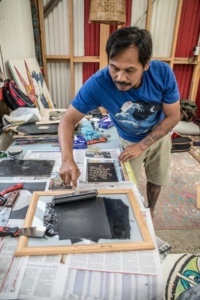 While this woodprint group is named after punk, their theme focuses on ecology and environment protection; they are trying to help local aborigines and farmers, holding woodprint workshop for folks and schools, and also selling their DIY hand print T-shirt. If you google “Pangrok Sulap”, you can find its connection with protest against the Sabah government’s building of a dam. Between seeing the familiar photo and getting a response from Indonesia, I decided this was not plagiarism or a case of imitation. I tried hard to find a clue from the situation of getting no response when trying to contact Pangrok Sulap. It was like I was trying to chew the glass shard kaya toast, chewing the “plagiarism” glass shard with the taste of the slightly salty blood, still trying to enjoy the beautiful visual perceptions and the strong Sabah spirit. In the daytime, if you stop your car at a red light, a gang of kids will come out from the side with rough instruments. They will sing for you, and proficiently ask for a tip before the light turns green. And if you take the most economy train, you can also see the spectacle of the food hawkers and singing kids flocking on while stopping. When night falls, the graveyard and the side of railroad tracks turns into a marginalized peoples’ amusement park. There is no light in the graveyard, so you can’t really see what they are selling on the long table; a few transgender people are holding umbrellas next to the graves in the dark and waiting for guests to come; I pretend the women who sit on the carpet beyond the train track are just waiting for friends to picnic in the dark. In the hot and dusky environment, I wrap a headscarf around me to reduce the risk of exposing myself. I have a strong feeling these marginal people are trying their best and using all kinds of unimaginable ways to survive. Living in this country with such a great gap between rich and poor, they only have each other to help to survive (Indonesian says “gotong royong”, means helping each other). The government hasn’t strong enough shoulders to support people’s lives. In 1998, young people came from all over the Indonesia to resist President Suharto who was dictatorial and seriously corrupt. Among them, there were two of the protesting art collectives in Java Island; “Taring Padi” in Yogyakarta and the punk band “Marginal” in Jakarta. Taring Padi is a collective formed from ASRI (Akademi Seni Rupa Indonesia, which means Indonesian Academy of Fine Arts) students, cultural activists and artists. They revived People’s Culture and populism by producing woodprint posters, music, large rally props and so forth, against the idea of “Art for Art’s Sake” and the condition of culture bound by capitalism. Printmaking has the character of reproducibility. Under the concept, artwork is no longer hanging-on-the-wall and collectable high-priced art. On the contrary, it becomes a functional mass media. Those handprint artworks were posted outdoors through sun exposure and rainfall. It’s not a pity, as it is only to achieve the purpose of information dissemination. Punk, the culture that most Taiwanese cannot imagine, might just be recognized by its peculiar visual character. As the world’s fourth largest populated country, Indonesia has an employment problem due to the imbalance of high fertility rate and a poor economy. It caused lots of wandering children who don’t have the opportunity to be educated. However, a punk band heroically appeared and flipped their life. In addition to being an anti-fascism and anti-idolization band, they teach the wandering children to play instruments, and provided them a sheltered place to stay. I guess for the Western original punkers, it might be hard to imagine how a Southeast Asian punk band sustained the disadvantaged children’s lives today. After listening to a few underground punk gigs, a friend gave me a few of his DIY woodprint fiber badges as gifts. The punk badges I’d seen before were made by embroidery or silkscreen print, but in the decade it seemed Taring Padi’s woodprint influenced the punk trend. After I interviewed a few of the Indonesian artists, I suspected the letterpress badges might have developed from the 1998 political protests; the art college system’s Taring Padi taught Marginal band the woodprint skill, and after that, Marginal held many punk workshops to pass on the skill and style. Eventually, the woodprint badges became the punk DIY symbol of Indonesia. The Pangrok Sulap works photos on Facebook are still lingering with me. In my experience, most artists didn’t allow appropriation, even attempting to convict the accused person. Therefore, I queried Taring Padi members’ opinions about this, and the response that they gave me entirely surprised me: “We don’t care about it.” About the other Malaysian side, I felt pity I couldn’t attend there in person. I did find the way to contact one of the Pangrok Sulap members, and hoped they could say something to flip my own thought, but, however, he didn’t respond with anything except greeting. The following is my interview with two Taring Padi members. I: I would like to know your opinion based on the (Pangrok Sulap) photos. I think some of the woodprint style is very similar to Taring Padi, in other words, it’s your style. Sudandyo: Those are not Taring Padi’s works, but they do look like Taring Padi’s style. Very good works, even better than ours. I know Taring Padi had few workshops in Malaysia before, perhaps these works are made by one of the workshop members. 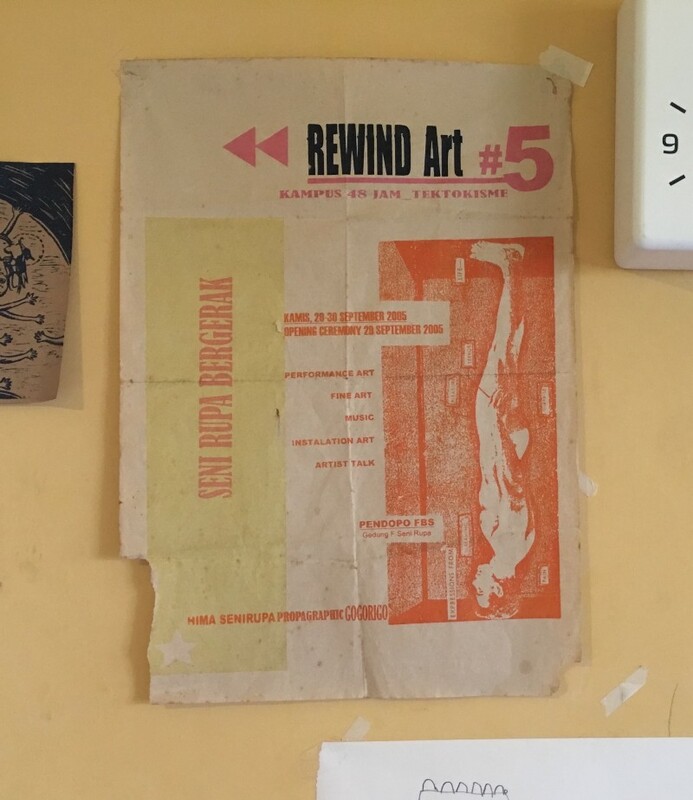 I: Actually those works are from a woodprint group call Pangrok Sulap in Malaysia. I’m curious you don’t care about other people imitating your style under workshop system? Sudandyo: As far as I know, Taring Padi loves to share this style. I: Surprised me! But for such an audience like me, who loves to seek for artist’s working context, it will be a problem to see works being imitated. Sudandyo: In fact, Taring Padi had already held lots of woodprint workshops around many communities and organizations. It won’t be surprising if some other groups use Taring Padi’s style. I: In Taiwan or some other western countries, we have Intellectual Property Law to protect creators. If audience found two similar art works, soon it will be revealed. Also, I think it is too generous to share the unique art style! Sudandyo: I think Taring Padi always believes the idea of sharing and spreading. I: Perhaps Taring Padi is not like the art circle artists who have the pressure to be famous or tend to love competition, but for a foreign audience like me, I can’t tell the difference between two groups by vision, as by my first glance seeing Pangrok Sulap’s artworks, I think that’s from Taring Padi by intuition. 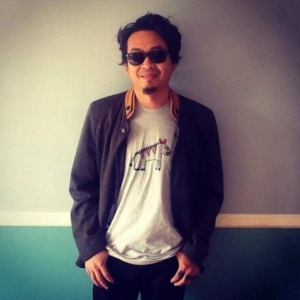 Sudandyo: I think Taring Padi really doesn’t care about what our style is, the importance is how to spread out the message. I: Have you heard about Pangrok Sulap and seen their art works? Djuwadi: I know Pangrok Sulap. Actually I met their founder in Malaysia last year, that’s a short resident project call “Transaction in the Field”. Indeed, they got lots of inspiration and influence from us. We are good friends, and they did express their honor to Taring Padi. We don’t care about any artists or art groups making the same artworks as us. 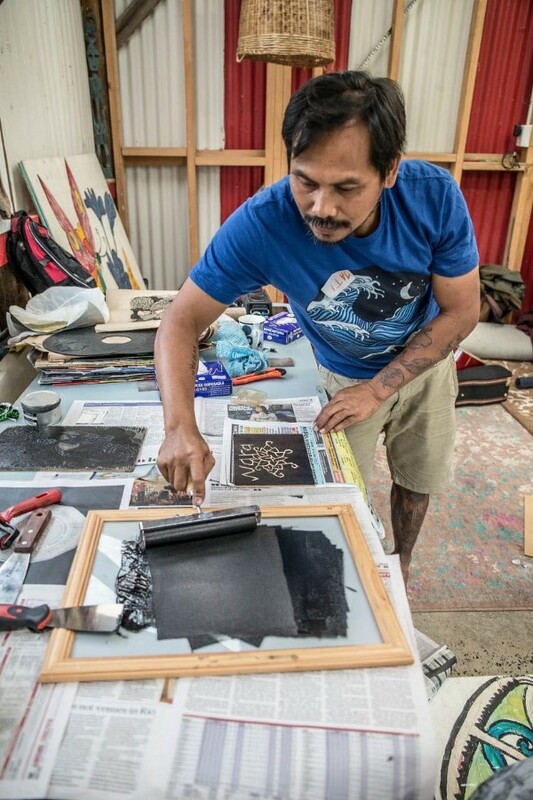 In fact, not only Pangrok Sulap’s woodprint looks like Taring Padi’s, there are many local Indonesian art groups using the similar technique as well. If you don’t really involve in the creation on Taring Padi, it might be hard to distinguish the difference between each other. Maybe that means we do have the talent to spread the message! I: Suppose both groups were invited to show in the same international art festival, do you think both side’s art style might confuse the audience? Djuwadi: In the Malaysian resident project forum, an audience indeed mentioned about this. And that’s why Pangrok Sulap admitted their works have strong influence by Taring Padi. But I say it again, the idea of Taring Padi is about how to spread the technique and knowledge, not focusing on the art works ownership and copyright. 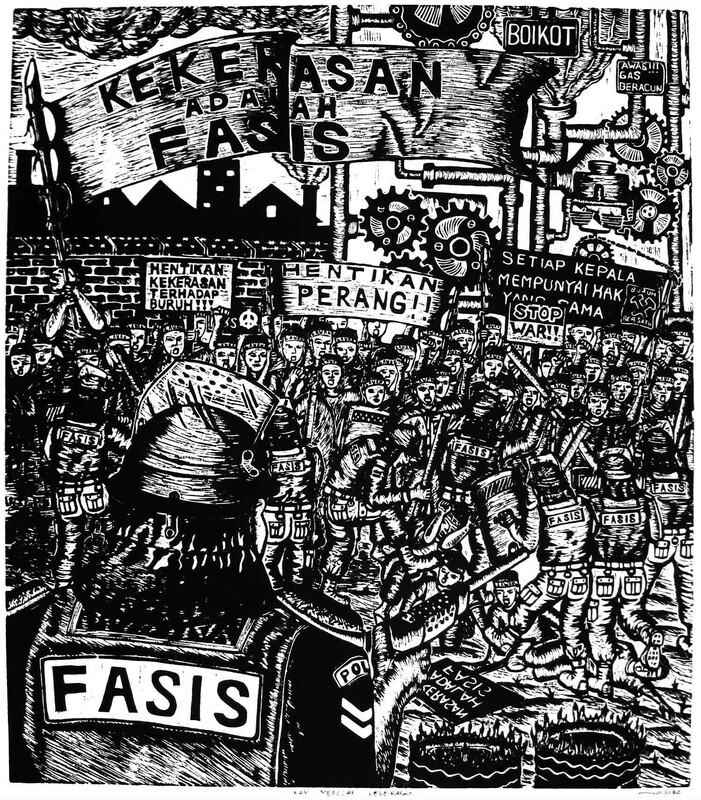 Retrospectively, the original print technique of Pangrok Sulap is from Marginal punk band, so people always can smell the propaganda poster style of Taring Padi, and also, the way of printing on the huge fabric is also Taring Padi’s early style for protesting. The workshop system brought learning and imitation, and students copied naturally. (Here take Taiwan Performance Art circle as an example; the workshop system actually goes against the original spirit of Performance Art. It is a hard-to-be-defined and a limit breaking art, but the workshop tends to form a style.) Looking back, I think I made a mistake: I shouldn’t treat this kind of functional political artwork as fine art. The attitude of Taring Padi, which welcomes other people to imitate/appropriate/plagiarize, truly achieves the purpose of spreading messages. We almost can define both groups’ arts as related, or classify them as a style of “Southeast Asia Punk political art”; everyone is welcome to participate in the folk art activity, such as the Paper-cut Art in Shaanxi, China. However, there must have been some phenomenon that let me misjudge Pangrok Sulap simply as appropriation/plagiarism, such as its “exhibition attitude”, “personalize artist members”, and its “way of exhibition” and so on. Pangrok Sulap was established in 2010, and the historical background is really different from 1998’s Taring Padi, especially nowadays when Facebook is such a convenient live social media. Taring Padi didn’t own the tool in the past. After transfering the special punk political culture of Indonesia, Punkrok Sulap chose a way that can be easier understood by western thought. In religion metaphor, if Taring Padi is un-worldly, Pangrok Sulap will be worldly. In Pangrok Sulap’s facebook, the photos showed artists’ cheerful expression in front of their artworks; they “frame” some of the print works and exhibit, and create artists’ personal brands. The (propaganda) photo shows how they introduce art to officials, or sell art work’s related products. The way and attitude is similar to current art circle artists, expecting to be seen, and ambitious to be famous. The way I observed Taring Padi seemed opposite, and despite the members having changed, they are still following the past wild style. No matter prints, drama or musical style, the group working method weakened the artists’ individuality, therefore audience couldn’t know the existing members. They never even had a formal exhibition in Indonesia. If you check Taring Padi’s Facebook, it’s rare to see artists facing the camera confidently, and photos focus on artwork, passing over artists’ physical bodies, and exuding a metaphysical spirituality. There is an Indonesian artist who found a style on the Internet, and copied the art works for a gallery. The works have been a big unexpected hit, and the artist has even become famous, but the Korean artist who had been copied immediately discovered this. The Korean artist started to expose the scandal on an Indonesian art website and asked people’s opinions, but surprisingly, just half of Indonesian netizens stood on the Korean artist’s side. And the more confusing thing is, the Indonesian gallery stands on the side of the plagiarizing artist. It’s hard to understand the case of the Indonesian art circle agreeing with plagiarism, and by the same token, I try to figure out Pangrok Sulap’s attitude. We are always used to thinking in the western way, and treat it an advanced method. Once we can’t deeply realize the condition, those Southeast Asian art cases can just be treated as “unreasonable”, or be distorted as another exoticism. Before researching Southeast Asian art, why don’t we (Taiwanese, or officially Republic of Chinese) learn their languages first? When I studied at university, most of our art teachers had European/American educational background. Due to the trend, I studied French for several years. Until now, I introspect my own attitude of arts: I am trained to understand the Western Art trend, but can’t always guess the tones of Indonesian art (though I have already observed them for a decade). We eliminated all the difficulty to learning European languages for involvement in the Western Art environment, yet it is rare to see Taiwan art researchers commit themselves to learning Southeast Asian languages. Ten years ago while I field-investigated in Indonesia, I saw many foreign professionals speaking fluent Indonesian language and cooperating with local people. Relatively speaking, this is still absent in the art research field. The language of Indonesia/Malaysia has lots of simplified and opposite word order (Object-Verb-Subject) comparing with Mandarin; lots of words directly convert from a foreign language, especially English. It has a special concept for describing time. For instance, for “Saturday night”, they say “night Sunday”(malam minggu), and “Sunday night” will be “night Monday”(malam senin), and in this subtraction concept, the night before Monday will be Sunday night. Besides, lots of noun and verb roots adding prefix will become a new word, such as the word masak (cook) extends to memasak (cooking), memasakkan(cook for…), dimasak (be cooked), pemasak (a chef), and masakan (food), etc. Why does this Southeast Asian phenomenon confuse us? Is learning local languages the necessary beginning for understanding them? In recent years, there are many Biennials and Art Festivals in Indonesia using the western way of exhibition, but the works are hard to be interpreted by the western thought. Their strong grassroots works always show disorderly messages for the rational brain, but their contemporary arts (which follow the mode) are more sensible by international standards. However, westernization could be a trap for Taring Padi’s anti-capitalism attitude. After finishing with resistance as a political issue, Taring Padi was invited to show in Singapore and Malaysia, where the poster prints transformed into business artworks. They successfully sold out overseas, and made their hometown artists envy them. A punk music musician let me stay in his small house for several days which he co-rented with his friends. Their bodies have lots of tattoos and piercing, and they worried about living as well as other people, living between the financial reality and the music dreams. I went to see several crazy underground gigs, actually close in style to death metal. Between punk and heavy metal, I had a problem distinguishing the music characters before, and I guess lots of Indonesian youth also cannot distinguish them. All they want is just some elements in music that can reflect their inner anger and then release it, not a theory of music. The rebellious spirit in punk culture and the gorgeous noise/ fast tempo of heavy metal fits the need for the group of angry youth. At present, Indonesia is the country that has the most punkers in the world, compared with us in Taiwan, where the subculture development is quite weak. I suppose the reasons are we have less population, Confucian thoughts, and with the condition of a curfew only lifted since 1987, the seeds of Taiwan punk and heavy metal spirit didn’t take root on the island. Moreover, the original western punkers might find it hard to imagine their declining spirit crossing over half of the earth to Southeast Asia, not only re-rooting, but flourishing. Compared with heavy metal’s high standard of musical skill, punk may have no relation with music at all. To continuing the punk spirit, both Taring Padi and Marginal still work with their special DIY woodprint technique. Shouldn’t we classify Pangrok Sulap as plagiarism, and just simply treat it in the same way as the duplication and division of the punk spirit? In the music documentary “RiP! : A Remix Manefesto” it mentioned “Culture Always Builds on the Past”, and developed CC(Creative Commons) as the way to solve the appropriation problem. The copyright agreement should include BY (Attribution), NC (NonCommercial), ND (NoDerivs) and SA (ShareAlike), but the terms are not suitable for the original creators. I’m curious how Pangrok Sulap define themselves. Moreover, in visual art history, probably only the 80’s Art Appropriation can make some humor in the way of copying. In addition, copying works as a tribute, but that’s another story. I remember the first time I was in Indonesia, I got a hand print performance festival poster on the street. 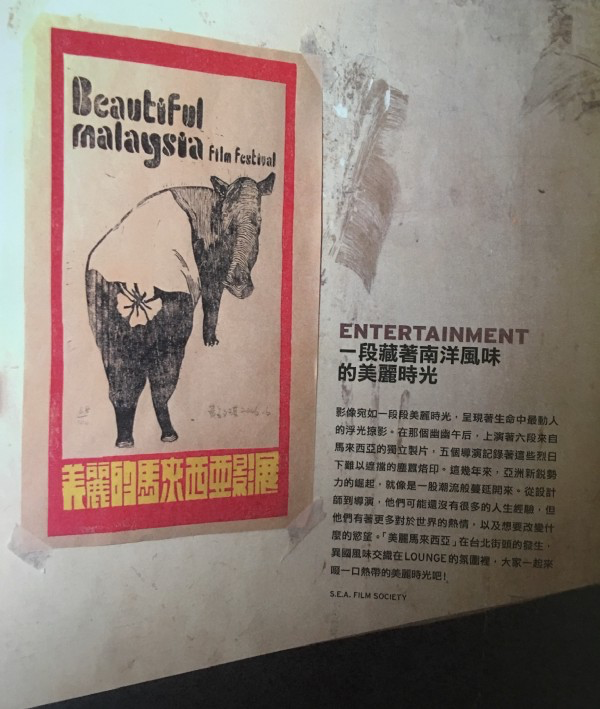 I didn’t know Taing Padi then, but just felt so touch to see “a can-be-sold printmaking becomes a regular poster and distributed everywhere.” After returning home, the former Malaysian boyfriend introduced the Malaysian indie film to Taipei. We held a petty film festival, and as the matter of fact I copied the way of Taring Padi, making lots of hand print posters and posting them everywhere. Should I treat myself as the duplication and division of the punk spirit as well? The hand print poster that I got from the Jakarta street is still posted in my room. Not framed, so to continue its proper spirit. Su-Kai Lin, Fiona Cheng, Djuwadi Ahwal, Lewis Gesner, Rizo Leon, Ronald Apriyan, Sudandyo Aprilianto, and Yogka Agustin. Huang Min-Chi is an artist, a writer, a mother and an outsider of Taiwan art circles. Focused on Indonesian political and activist art since 2005. 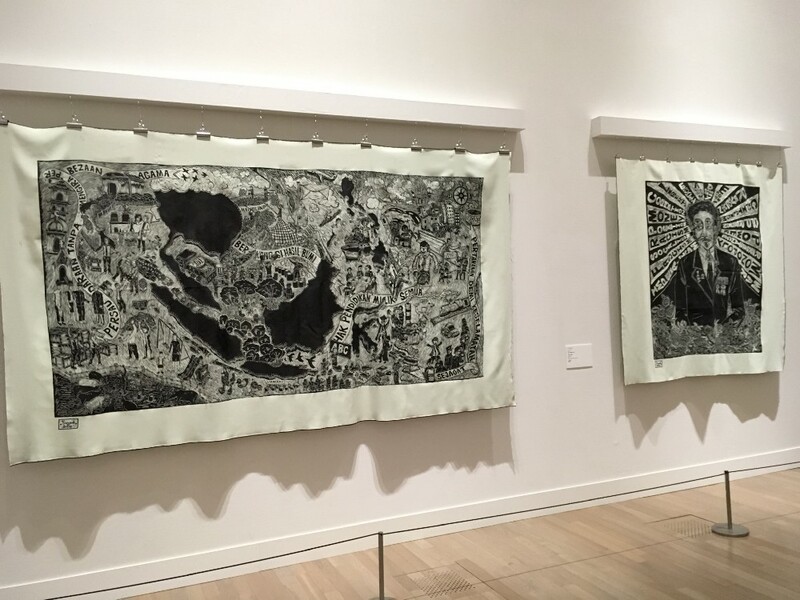 In March 2017, the members of Pangrok Sulap and their volunteers co-created a huge woodprint work, and showed in an exhibition called “ESCAPE from the SEA”, which was held by Japan Foundation Kuala Lumpur in Kuala Lumpur, Malaysia, but after being open for 3 days, the work was requested to be removed by the government, and the reason was the image was “too sensitive”. To me, this work has similar visual style as early stage Taring Padi. Sadly, this punk spirit tribe that originated from Indonesia was hampered when flowing to the conservative Malaysia.